Isobel is a child of the Territory. She grew up in a saloon, trained to serve drinks and fold laundry, to observe the players at the card tables and report back to her boss on what she saw. But when she comes of age, she is given a choice…. She looked up, away from his hands, and was caught by a gaze the burnt gold of the morning sun. Isobel chooses power. Chooses risk. Chooses to throw her cards in with the Devil, Master of the Territory. Available at the following fine book-shilling establishments…. “Laura Anne Gilman has reimagined an American West that is alluring and gritty, strange and utterly convincing. Her prose is stunning, and her story and characters grabbed my heart and would not let go. 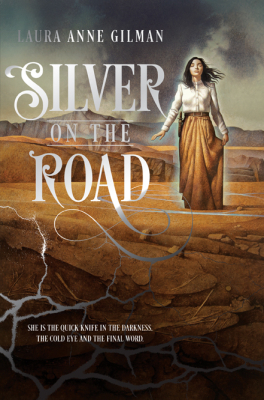 Silver on the Road is pure gold.” – David B. Coe/D.B. Jackson, author of the Thieftaker Chronicles.